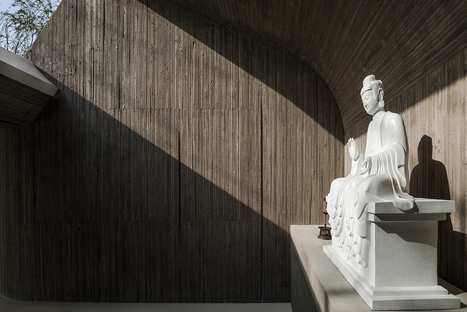 Han Wen-Qiang and Archstudio’s new Buddhist temple on the river in Tangshan, in northern China, is a highly symbolic project. Archstudio has designed an underground construction with open courtyards and skylights that let the temple’s natural surroundings come in and promote meditation. 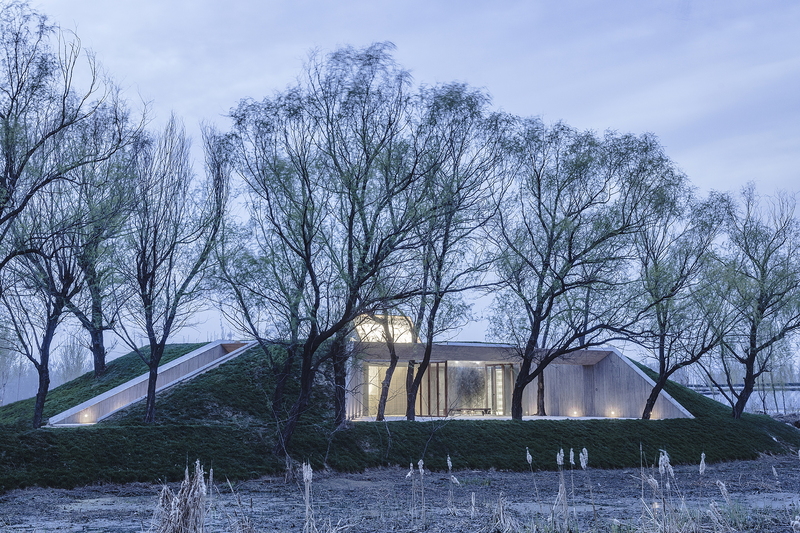 Han Wen-Qiang and the Chinese architects of Archstudio have designed a Buddhist temple in the city of Tangshan, on the Tanghe River. Archstudio’s project is largely underground, symbolically rooting human life in nature, but it has skylights and outdoor courtyards symbolically offering people light to illuminate their footsteps. The entire plan for the new Buddhist temple is highly symbolic, feeding and developing its forms out of this symbolism. 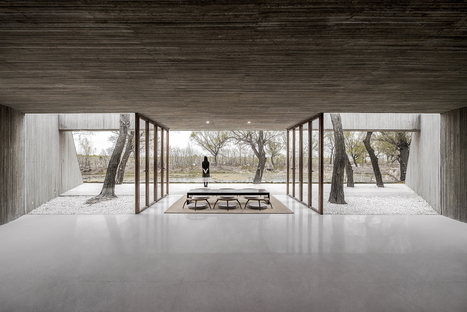 Archstudio’s floor plan touches on key elements of Buddhism such as earth, trees, light and water. The site is bordered by the Tanghe River to the east and characterised by a natural mound topped by tall, luxuriant plant growth. The road running to the south does not disturb the peace, while to the north of the site there are a number of greenhouses for growing vegetables. In the original spirit of a place for contemplation, no trees had to be harmed, and so the building has been constructed underground, being careful to avoid harming the living things already in existence on the site, even if this results in an irregularly shaped floor plan. The layout of the underground floor brings to mind the roots or branches of a tree, with a central space containing a tea room and four additional spaces branching off from it. First of all, the outdoor corridor, dug into the soil and used as an entrance: a long, narrow access route with tall concrete walls that cut boldly into the soil, cutting off the view of the outside world and helping worshippers entering the temple to concentrate. This is followed, from south to north, starting on the side opposite the river, by two “branches” with open courtyards and, between them, a “branch” for meditating before the statue of Buddha. The human space is separated from the earthen wall containing it by the roof and by bare concrete walls of imposing width, with refined details. 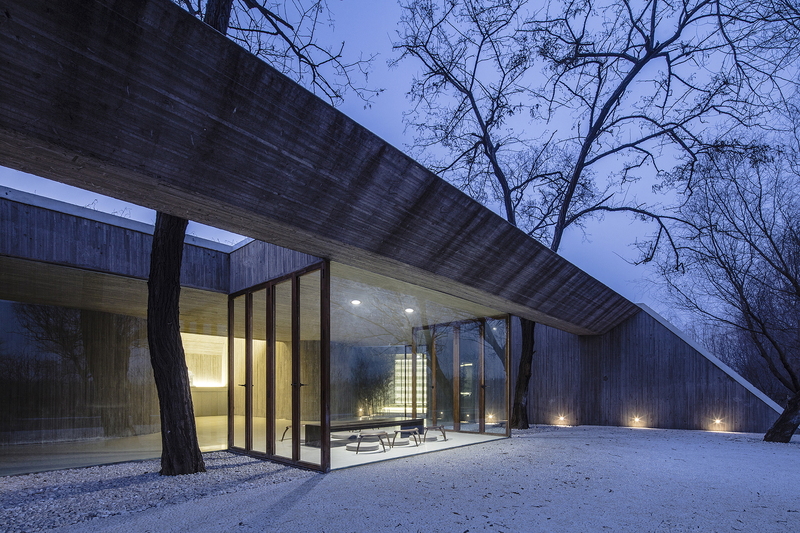 Its surface reflects the details of the formworks, made out of pine boards only 3 cm thick, reproducing both the pattern of the veins and the close-knit succession of boards. The floor-to-ceiling windows bordering the courtyards are joined to the concrete ceilings without frames, another interesting detail of the project. The pale monochrome floor becomes white gravel in the courtyard and cement with white pebbles on the side facing the river. The trees that were already growing on the site are incorporated into the courtyards, and the skylight lighting up the statue of Buddha, along with the courtyards, creates the feeling that the building has always stood on this site, and that human beings have carved themselves out a place for meditation in the bowels of the earth. A space in which rational thought is expressed not only in the humble wealth of the details, but in their symmetry, with an axis born out of the statue of Buddha, passing between the two trees in the courtyard to join the river.